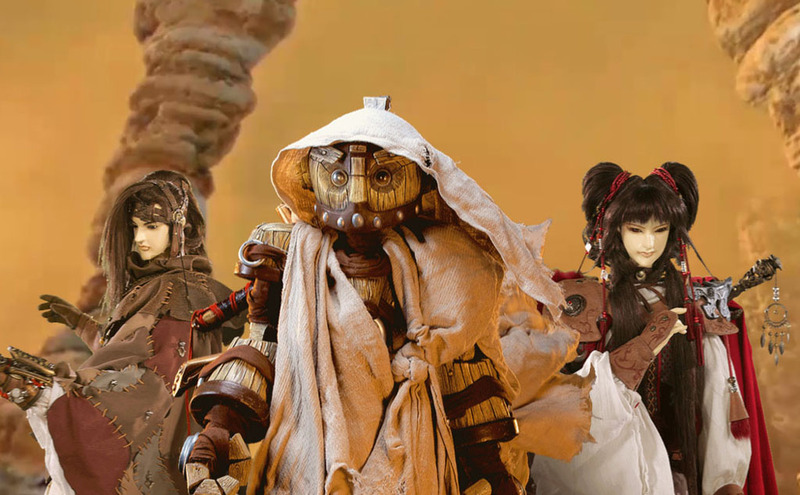 The Arti-C, centre, a wood-and-metal mechanical man, is the title character of The Arti: The Adventure Begins, an animated film from Taiwan that’s being shown at the 2015 Fantasia International Film Festival. On the left is Mo, on the right is his sister Tong. The Arti-C was invented by their late father. Martial-arts fighters with lightning moves, the clang of swords, the whoosh of garments, special effects and. . . puppets? The Arti of the title is actually Arti-C, a wood and metal mechanical man with movable eyebrows and Astroboy ankles. He is like a sibling and a servant for brother-sister orphans Zhang Mo and Zhang Tong, and he’s controlled by a sort of wearable console on Mo’s arm. 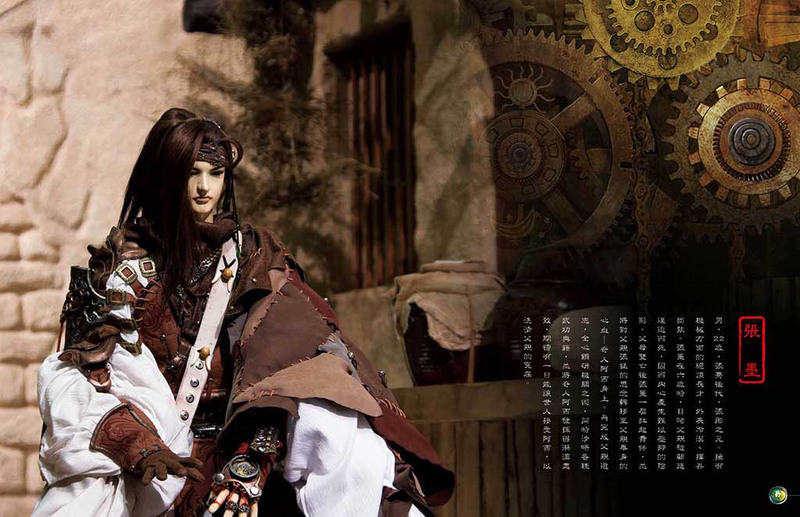 Zhang Mo wears the controls for wood-and-metal mechanical man The Arti-C on his left arm. 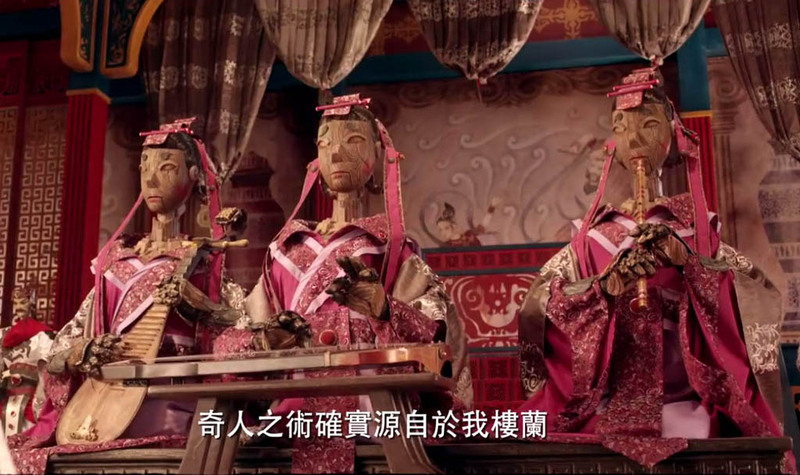 The film is set in ancient China and contains many familiar themes, in addition to the orphan one. For example: being outcasts/misunderstood while carrying on a father’s work, a desire to restore the family honour and that father’s reputation, going on an adventure to unfamiliar and dangerous lands. The younger sister, Tong, is the “feisty female character” who is quite handy with weapons herself. Mo looks a bit like a manga character, with his hair falling fashionably in his face. The Arti-C runs on a mysterious power called The Origin, which seems to be petering out. So Mo, Tong and the Arti-C go searching for The Origin’s source. While they are still at the local market, which seems like quite a multinational sort of place, a red-haired woman named Kameedia just blatantly invites herself along on their adventure. Mechanical musicians in The Arti: The Adventure Begins, an animated film from Taiwan thats on the program of the 2015 Fantasia International Film Festival. In the course of that adventure, they will cross a desert, ride giants camels and insects, get caught in a sandstorm, visit the luxurious palace of the King of Loulan, enter the Arti-C in a martial-arts tournament against many impressive foes, and meet several scary creatures, human and otherwise. There’s an environmental message, and a “why can’t we all get along” one, too. Before I read any background material about the film, I could tell that Avatar was one of its inspirations. Stick around when the credits start to roll and you’ll see the creation of the puppets, the sets (some with green-screen backdrops), scenes being shot, and some of the many, many people involved in making the film. The Arti: The Adventure Begins seems to indicate the possibilities of sequels if this first film is popular enough. The elaborate details of The Arti: The Adventure Begins are quite amazing. 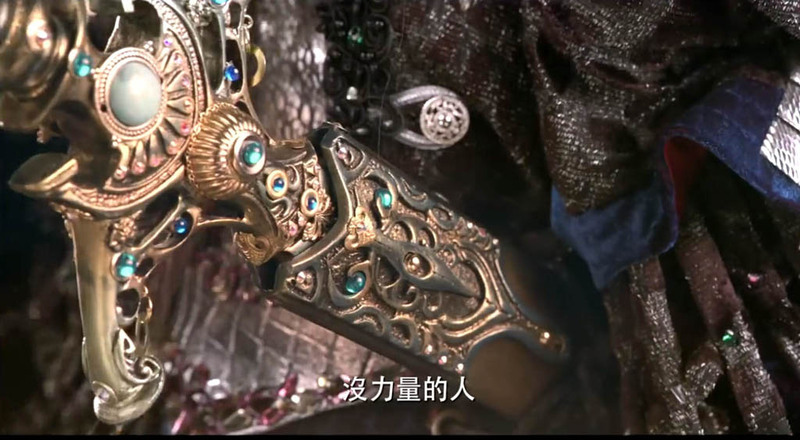 Here is a close-up look at a sword. BTW and FYI: I was curious about the history of mechanical men. While researching that, I came across an interesting article on a Stanford University web site. The title is Man-machine and Artificial Intelligence and it’s written by Bruce Mazlish. It’s adapted from Mazlish’s own book, The Fourth Discontinuity: The Co-evolution of Humans and Machines, Yale University Press, 1993. Is the Mo Ti mentioned here the same Mo of the film? Maybe not, but maybe the name was inspired by him? The Arti: The Adventure Begins, will be shown once, on Sunday, July 19, 2015, at 13:00 (1 p.m.) in the Hall Theatre, 1455 de Maisonneuve Blvd. W., in downtown Montreal. The monsters aren’t so scary that you couldn’t take your children! Previous Post I want to go to ShazamFest, don’t you?